Booking Widget - General Book Now Button? Is there a way to access a general booking button code that would allow the renter to drop down to the property they want from other pages on the site and book. (Kind of like the drop down I get when creating a new inquiry from my dashboard). All I can think of is to make a custom button that looks like my book now buttons and have it direct to our contact page and have a form there. Unfortunately then I loose the beautiful feel of the booking pages and it is a few too many clicks. (Not to mention I then have to enter manually). I would love any thoughts or help here! If you're referring to the one below, then no, we don't have a way to embed this popup into another website platform. You're asking a great question here, but the Book Now button & subsequent booking page is restricted to individual properties for now. One thing to think about is that the page function doesn't allow users to browse the property at all (ie. you can't see photos or a property description), so I wouldn't necessarily recommend that as the landing page for a site-wide call to action, even if it had the option to drop down to view each property. Travelers would have to be pretty far down the decision funnel before landing on that page which is designed to just capture reservation details and payment. However, something in between our booking page and the full property page would be ideal. 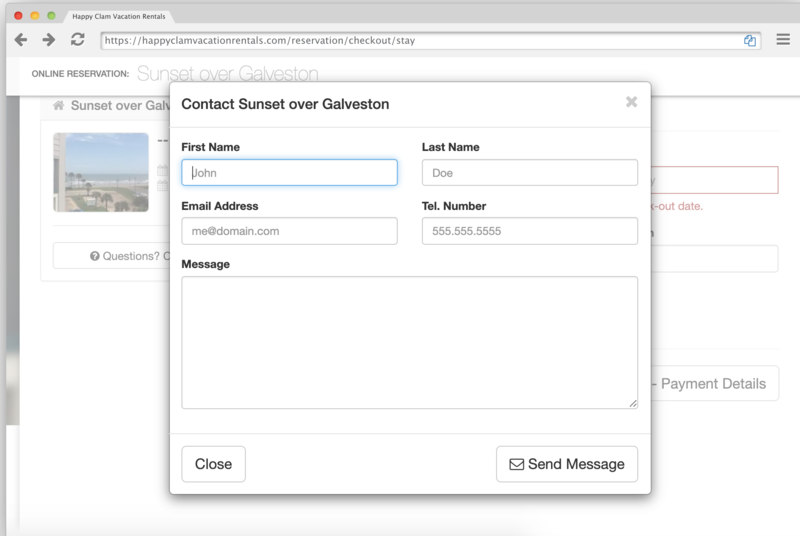 If you're using WordPress, I would suggest the Contact Form 7 Plugin. I would also suggest you activate the Akismet API in order to block the flood of Spam you will receive through the Contact Form.